Han Chae Young (한채영) attended Uhm Tae Woong (엄태웅) and Yoon Hye Jin (윤혜진)'s wedding reception held in Seoul, South Korea on January 9, 2012. The actress wore an entire ensemble from Balmain. 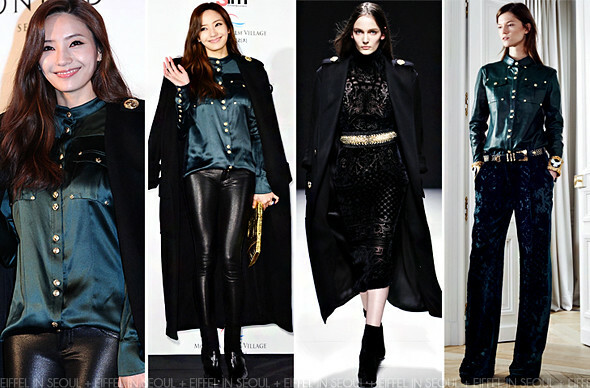 Her satin blouse from Pre Fall 2012 was styled with a long coat from Fall/Winter 2012 collection. Black leather pants, patent boots and complementing gold clutch to complete her look. As usual, perfectly put together. However, I would like to see more feminine dresses on her.